L-R Mike Burks, managing director of The Gardens Group, Amy Brice, director at Freshly Ground PR, Dr Andrea Keltey from FOLD, Christine Stevens, chair of FOLD, Eddie Trim, secretary of FOLD and Barry Watts, coordinator of The Green Shed, which is based at Castle Gardens and receives financial support from FOLD. 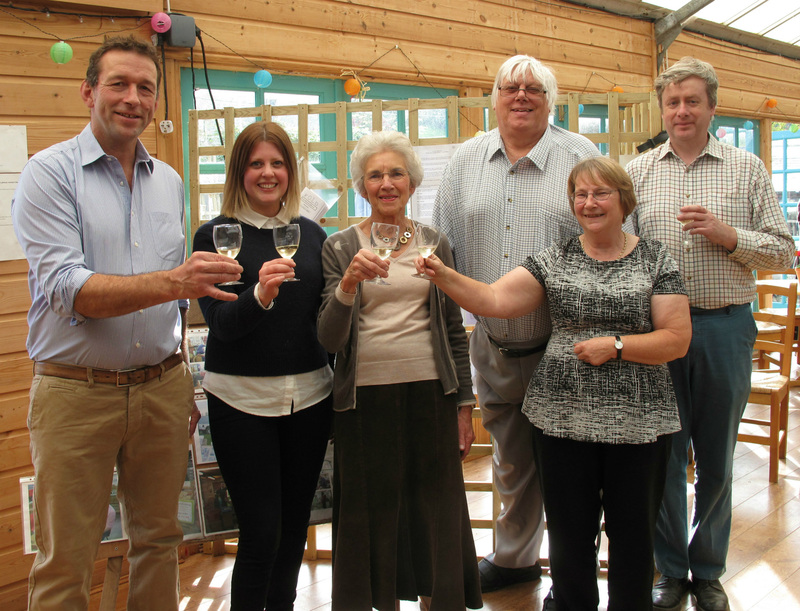 Tea, cake and bubbles helped get FOLD’s 60th anniversary celebration underway on Tuesday. Set up in 1955, FOLD is a very inspirational charity, supporting and enhancing the lives of people with learning disabilities in North Dorset. It was an absolute pleasure to host the celebrations and hear all about the innovative projects that the volunteers have carried out, from helping individuals overcome personal hurdles to assisting them with moving onto independence with items for their new home, such as cookers, carpets and the hire of a removal van. The celebrations welcomed local businesses and residents from across the community, as well as representatives and service-users from the organisations that receive support from FOLD. One of these organisations is The Green Shed, which is based at Castle Gardens and run by Tricuro and offers hands-on working opportunities for adults with learning difficulties. We wish FOLD a very happy birthday and many more to come. For more information about joining FOLD, donating or to find out more about the support that FOLD provides in North Dorset, please contact Eddie Trim, secretary, at foldnorthdorset@hotmail.co.uk. On Sunday I was lucky enough to go to BBC Radio Solent’s studios in Southampton with Barry and Jamie from The Green Shed. We were invited by the producer of the radio station’s gardening show ‘The Good Life’ for a live interview to talk about The Green Shed, how the project came about, and what it offers and how gardening and recycling projects are good forms of therapy. You can listen again to the show with Georgie Windsor if you follow this link: The Good Life. Talking of therapy, this week, now that all the Christmas displays are finished and open, Louise and I have been able to get back to gardening, or rather giving gardening advice. This week it’s been on everything from how to deal with overwintering geraniums, to writing an article for The County Magazine on the alternatives to a Christmas tree – yes such a thing does exist and is very popular!! Other news this week is that The Orangery (a beautiful oak extension to the existing Engine Room Restaurant) at Poundbury Gardens is almost ready. The team is giving it a few finishing touches ready for the launch next week. Everyone is invited to celebrate the opening; there will be a free drink for everyone, canapés, and even a free prize draw all weekend where you can enter to win some great prizes including £100 worth of Christmas decorations, £50 worth of plants, a luxury food hamper and much more. We’ll be celebrating from 5.30pm – 8.00pm and look forward to welcoming you.